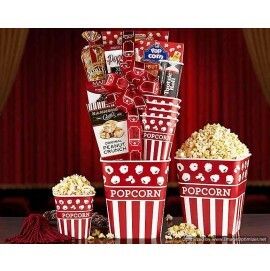 This nostalgic popcorn tub is filled with a collection of movie theater favorites. Hammond's peanut crunch, Walkers shortbread cookies, and a Tootsie Roll bank filled with Tootsie Rolls arrive with Popcornopolis caramel and kettle corn mini popcorn cones, microwave popcorn, zesty ranch popcorn seasoning and four smaller popcorn tubs so everyone can join in the fun. Gift Size: 9" x 8" x 14"